Poisoned Pen Letters: MOTHER'S DAY OUT has hit the virtual shelves! 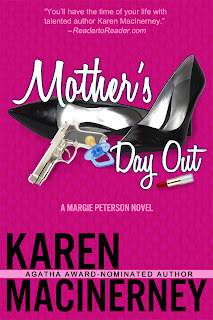 Life is pretty typical for stay-at-home mom Margie Peterson. She’s got two young kids, an attorney husband who never quite makes partner, and a fixer-upper house she doesn’t have the money to fix. Things are rolling along fine until the first preschool tuition bill hits the mailbox, and Margie realizes it’s time to take out a second mortgage…or get a job. Margie’s mother-in-law wants her to join the Junior League, her mother thinks her aura needs adjusting, and her husband wants her to sell Tupperware. But Margie decides on something more exciting than washing dishes at charity teas or matching plastic lids with bowls. When a seedy PI agency hires her as a part-time private investigator, Margie finds herself tracking an obese plumbing salesman with a penchant for Saran Wrap and bargain-basement hookers. But Margie’s no Sam Spade. By the end of her first day, she’s totaled her minivan, submitted a picture of a naked man in Saran Wrap to the school newsletter, and accidentally participated in a drag queen contest. When she finds a dead transvestite in the “Princesses’” room of a gay bar, she decides it may be time to hang up her hat and start planning Tupperware parties. Then she picks up the drag queen’s phone … and discovers the last call the dead man made was to Margie’s own house. I hope you have as much fun with Margie as I did. Web updates should hit any day now, and the site should a whole new look in the next few months as I have it redesigned so that I can update it myself. In the meantime, I'll be in my office, working on the next book and trying not to let the sleeping pets lull me into a nap. Or wrangling cucumbers in my overgrown garden (the vines are threatening to swallow cars parked on the street). Or checking up on my Facebook friends. Or all of the above, most likely.